Protect your assets with efficient and secure data recovery and computer disposal. When your equipment needs to be phased out, security and privacy can be a major concern. Whether you’re reselling or throwing away your old technology, you need to ensure your school’s sensitive information doesn’t fall into the wrong hands. We help you securely dispose of your equipment and properly deduct recycled technology to lower your taxes. Virtucom’s asset recovery service can assist or complete the entire process for you. 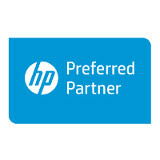 We work to customize a process that meets your needs from logistics, security, and discarding of the equipment. To absolve your school or district from any environmental liability, we abide by EPA and RCRA (U.S. Resource and Recovery Act) guidelines when disposing of your devices. You receive a complete inventory listing, along with a Document of Liability Transfer for your records. 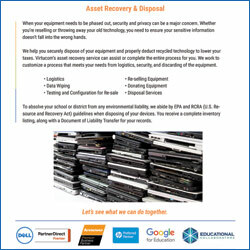 Contact us for more information on our asset recovery and disposal services, and see how we can help your school today.